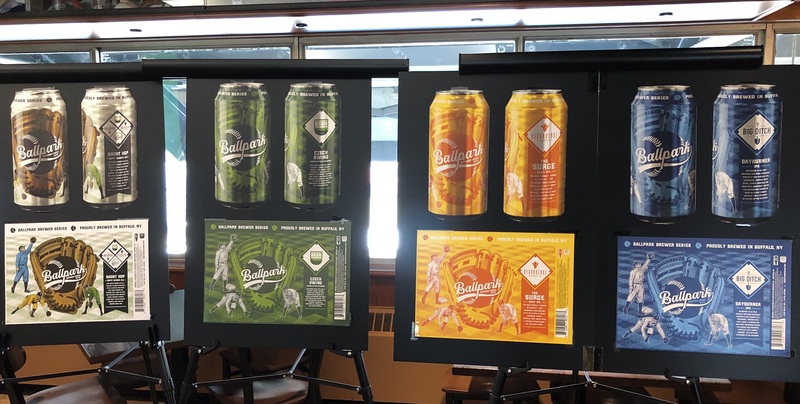 For the third time in four years, three Buffalo breweries will produce a collaborative beer, as well as their own individual offerings, for the Ballpark Brewer Series with the Buffalo Bisons. Big Ditch Brewing, Community Beer Works and Resurgence Brewing Co. have joined together to brew Short Hop - a hoppy blonde ale - at CBW's 7th Street taproom, available in cans beginning Memorial Day (May 27) at Sahlen Field, the renamed home of Buffalo's Triple-A baseball team. "[Short Hop] is a nice balance, not super-duper crazy hoppy like some IPAs, but a little balance where it's still nice and fruity," described Matt Kahn, president of Big Ditch Brewing. CBW's Ryan Demler will handle brewing duties for Short Hop, but the other two breweries will also be involved in the creation process. For their individual special beers, Big Ditch Brewing will unveil the Dayburner, a lower alcohol-by-volume version of Hayburner, its flagship IPA; Community Beer Works will debut Czech Swing, a Czech-style pilsener; and Resurgence will call on The Surge, a hazy IPA known also as CitMo 2.0. CBW brand manager Christopher Groves handled the artwork for the series. In addition to their individual availability for Bisons games, the special brews may be purchased all together, in four packs, at Consumers Beverages and Wegmans locations, for $14.99. "We think it's pretty fun, it's unique," said Community Beer Works president Ethan Cox of the series. "I don't think there's any other market where anybody has put four different breweries' beers together in a single package, with a collab, to celebrate an institution like a ballpark. I feel like it's super Buffalo." • Big Ditch's Dayburner: 5.4 percent ABV, a light India Pale Ale brewed with four different hops, has flavors of orange and tangerine juice. • Community Beer Works' Czech Swing: 5 percent ABV, a pilsener with a bread-y, malty flavor with medium bitterness. • Resurgence Brewing Co.'s The Surge: 6.5 percent ABV, a New England-style IPA with tropical fruit flavors. • Brewers Series' Short Hop: 5 percent ABV, a hoppy blonde ale that emphasizes four hops with lemon, citrus and stone fruit flavors. The brewers geared their releases to fit the atmosphere of summer baseball. "We thought it would be nice to do [something] light, easy-drinking, approachable ... [Czech Swing] seems like a baseball kind of beer," explained Cox.